The FTB-1200 Series has been discontinued. Please see the FDH-1 Series as a possible alternative or contact our Flow Engineering department. All wetted parts of OMEGA’s FTB-1200 Series turbine meters are TFE including liner in the flowmeter housing. Magnets are embedded in the TFE blades of the rotor assembly. 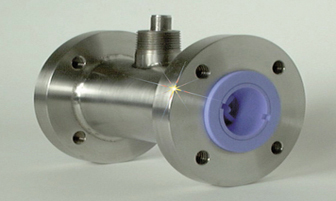 Within the turbine flowmeter, the flowing medium engages a vaned rotor causing it to rotate at an angular velocity proportional to the flowrate. The pickup coil senses the spinning motion of the rotor through the housing and converts it into a pulsing electrical signal. Totalling the pulsing electrical signal directly yields to the total flow, while the frequency is linearly related to the flowrate. Sleeve-type bearing, rotor, cones and flow straightening sections are made of machined TFE . 150# ANSI flange size available in sizes from 1 /4 to 3". The TFE series offers a linearity of ±1% of reading and a repeatability of ±0.1% of reading. 참고: To order with Signal Conditioner, specify: SYS/FTB-12**/Signal Conditioner number. Example: SYS/FTB-1201/FLSC-28, 1 / 4 " turbine flowmeter plus 0 to 5 Vdc scaled frequency pulse output signal conditioner. * Units are only compatible with integral mount signal conditioners FLSC-51 and FLSC-51B. Comes with complete operator’s manual and NIST 10-point Calibration Certificate for 1 CK for water.